In honor of St. Patrick’s Day, let’s take a look at another popular Irish song. “Too-Ra-Loo-Ra-Loo-Ral (That’s an Irish Lullaby)” was made popular by Bing Crosby in the 1940s, however it’s origins date back much farther than that. 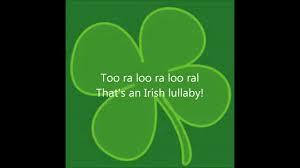 In reality, “Too-Ra-Loo-Ra-Loo-Ral (That’s an Irish Lullaby)” is not an Irish song, but an Irish-American song. “Too-Ra-Loo-Ra-Loo-Ral (That’s an Irish Lullaby)” was written in 1913 by James Royce Shannon. The song was written for the Tin Pan Alley song play Shameen Dhu (“Black-Haired Jimmy” or “Dark Jimmy”). Before the play opened Chauncey Olcott, a popular singer of the day, recorded and released the song. His single reached #1 on the music charts in December 1913. In 1944, Bing Crosby released his popular version, bringing it back to the public’s attention. Crosby performed the song in his film Going My Way, before releasing it as a single. In 1945, Crosby’s version was featured in the film Nob Hill. Others to cover the song include Bobby Darin, Jerry Lewis and Dean Martin, Gene Autry, Regis Philbin, Perry Como, Rosemary Clooney and The Irish Tenors. However, Bing Crosby’s version continues to remain the best known version of this Irish lullaby.